Home Corporate wellness How to organize a workplace wellness program in 3 minutes? How to organize a workplace wellness program in 3 minutes? Are you an HR professional looking for a way to lower absenteeism, boost job satisfaction, improve productivity, increase employee retention and lower healthcare costs? Or are you an employee who is tired of your company’s stale wellness program and looking for a better way to motivate yourself to stick to personal health and wellness goals? Keep reading and we’ll explain how to launch an effortless workplace wellness program that increases health, motivation and team-building through a custom virtual race powered by Racery. But first, some quick affirmation that you’re headed in the right direction. Yes, employee wellness programs have a HUGE positive benefits! A recent Harvard study of 20 successful wellness programs found that shifting employee views of wellness from being a product consumed annually at the doctor’s’ office to a lifestyle practiced daily in small choices and habits can have a huge impact. “For the organizations in our study, this translates into average annual healthcare cost increases of 1 to 2 percent compared to the 7 percent national average,” the authors wrote. Another group of Harvard researchers found that for every dollar large employers spent on wellness programs, company medical costs fell about $3.27 AND absenteeism-related costs fell about $2.73. So how to implement an employee wellness program cost-effectively? First, wellness programs need to be holistic — a web of policies and practices that are woven together to impact multiple aspects of staffers’ health. Second, effective wellness programs should be lifestyle oriented — promoting healthy hobbies, activities and habits — rather than focusing on clinical outcomes like weight and blood pressure. In other words, the means are as important as the end goals. Finally, the best wellness programs are social, harnessing the power of the herd to help keep the individual on the right path. “The best programs actively design for ‘grassroots’ partnership and harness the power of shared accountability to sustain engagement,” write the authors. A virtual competition surrounding the number of miles walked or ran each day is a perfect all-inclusive solution that fits around an employee’s existing schedule and routine. Employees are encouraged to exercise on their own time, wherever they are, and walkers can compete against runners since speed is of no importance! The repetitive act of self-reporting daily miles helps instill healthy habits and a more active lifestyle impact multiple aspects of staffers’ health! By turning the challenge into a team competition and providing a visual board to highlight staffer progress, employees are held accountable to their peers which serves as a tool to motivate them to complete more miles! While many companies rely on spreadsheets to track employee progress, you can take just three minutes to launch your own custom wellness challenge powered by Racery. Individuals or teams (for example, departments) can compete based on miles walked, ran, swam, cycled or rowed! After each person logs his or her own daily miles, progress is mapped in real-time onto a cool virtual route complete with 360-degree street views. 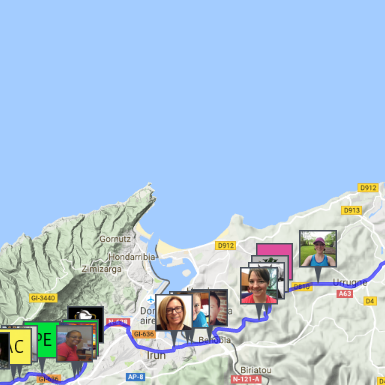 Racers get real time updates on other racer’s progress. Achievements (like longest run of the week or new streak) are also recognized. The hassle for HR of keeping up with everyone’s entries and maintaining the race disappears. All you have to do is share the race link with colleagues and Racery manages and motivates the racers! cost-effective: a two-week customized 50-employee race costs as low as $0.43 per person per day! effortless: after you share the link, employees take care of the rest — health champions emerge and are highlighted in leaderboards, employees motivate and support each other by commenting and liking each other’s activity and visible progress keeps individuals accountable to their peers! easy-to-use: no fancy gadgets required to participate, miles can be logged via desktop, mobile web or our app! On top of that, measured against Harvard’s study standards, many traditional wellness initiatives fall short in comparison. If you’re ready to spend hours soliciting booth vendors (dentist offices, chiropractors, running stores), printing up flyers and coming up with raffle prizes — an annual health fair is a great and cost-efficient way to go! Of course we’re assuming you have some free time to take on the responsibility of organizing this event in your already hectic schedule! low-effect: once the health fair is over, everyone returns to their positions and may slump back into their routines. Unless there is follow-through, a health fair can seem like an empty gesture. Whether it’s based on a daily intake of fruits and vegetables or water, prompt employees to fill their daily nutritional requirement for an entire month! Personally, we’re not sure if reducing our chocolate and coffee intake in exchange for fruits, veggies and water for an entire month would make us more happier and energetic at work in the short-term, but we definitely do not dispute the long-term benefits if the habit sticks! low-cost: no company investment required – unless you decide to supplement this initiative with that state-of-the-art cafeteria! high-effort: break out that spreadsheet knowledge or bulletin board, because you need a way to track everyone’s progress on a daily or weekly basis! Once again — if you have spare time to navigate vast search results for “nutrition”, “healthy habits” and “fitness” to curate fun and engaging content to e-mail to employees once a week or month, a wellness newsletter is a great way to include all of your employees. high-effort: you have to figure out compelling content to encourage employees to read the newsletter, and if you’re not artistically-inclined, you might have to get help from your IT or design department to help you make the newsletter visually attractive! low-impact: this initiative is once again missing the habit-forming aspect of a successful wellness program, not to mention how do you know if employees actually read it? While each one of these options hints at one or two of the best practices mentioned in the Harvard study, they require significant effort and are often short-lived! Instead, we humbly suggest a more comprehensive option that hits all three of the best practices and with not much effort on your part to implement it! How to spice up your fall marathon training? Challenge colleagues to a virtual run around Paris!